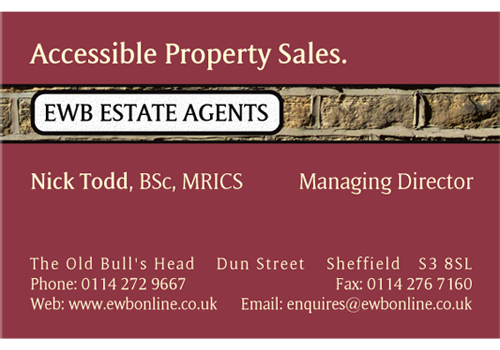 EWB Estate Agents has a long history, going back a century. When they started the business up again from a dormant state, they wanted it to move to the web immediately. ardes were able to help implement some great ideas to make an innovative site that addressed real-world concerns. As an agency servicing the Sheffield & Chesterfield areas, they have a lot of local knowledge, including the bid system: the housing market is very competitive & prospective buyers offer the vendor sealed bids. It’s a lot like an auction—the slowest auction you can imagine. The agent goes to the home owner, presents the bids & then notifies the prospective buyers whether they’ve been successful or not. If not, the prospective buyer sends a new bid. This can take a long time, is fraught with potential miscommunication & takes up a lot of the agent’s time—time for which they cannot usually bill. This is a golden opportunity for business process automation. ardes created “Live Offer” a system which automates the whole sealed bid process. Prospective buyers, who are vetted by EWB before they can register to use the system, can submit bids over the web. Competing prospective buyers know when they’ve been outbid & can take immediate action—and they can be notified of any changes to their bidding status via mobile phone, accelerating the home-purchasing process immeasurably. Vendors can keep an eye on the status of all bids for their homes & can sell their homes more quickly. All of this happens in real time. in addition, estate agents aren’t running around & putting in unpaid work—it’s being done for them, automatically. Everybody wins. A common requirement of enterprise-level web development is integration with legacy systems. In the UK, estate agents are serviced by a handful of software vendors who supply desktop applications to manage the business of running an estate agency. In that respect, EWB was no different—but they were different in their desire to integrate these proprietary systems with their website. It’s not uncommon for companies with websites to find themselves inputting the same data twice: once into a desktop application & then onto the web. At worst, they’ll forget to update either the desktop application nor the website. Sometimes they take the step of copying the text from the first & pasting it to the second. You may have experienced the unintended consequences of this on some websites—instead of proper typographical symbols like quotation marks & ampersands, you’ll see small boxes or question marks. The web application doesn’t know how to translate these characters properly for the web, so they are mangled in the process. An attempt to accelerate the work process—copying & pasting—only serves to make matters worse. There should be a better way. And ardes made one. Instead of forcing the poor user to manage the process of integrating the data in both desktop application & website, we devised an export feature from the desktop application—the user chooses which homes should be placed on the web, clicks ‘Export’, and the website is automatically updated with the new homes. The user’s job just got a lot easier. The EWB website does more than the desktop application anticipates, however. 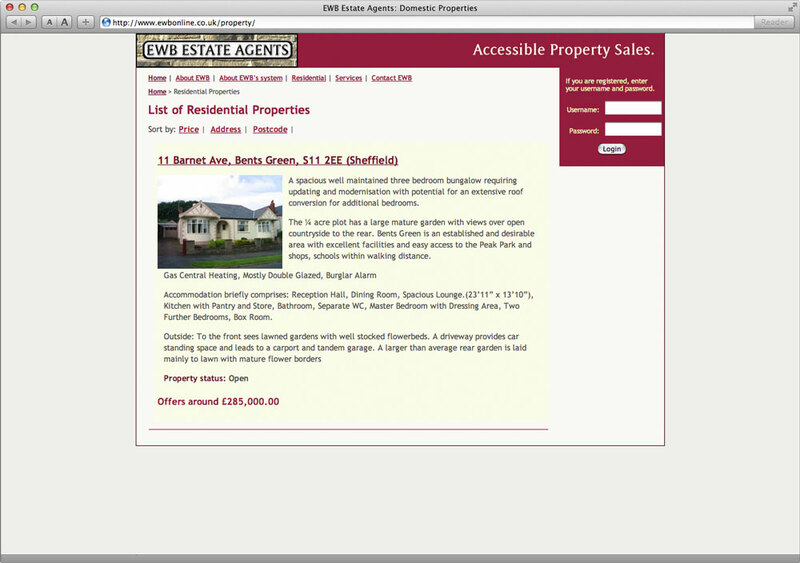 The updated homes are held back from public view until the site’s administrators can look through & update those aspects of the Live Offer system that aren’t covered by the desktop application, such as linking with the home’s vendor, setting up minimum bids & minimum bid increments, linking up multiple photographs of the home in question & attaching supporting documentation, such as floor plans and promotional material. And of course this is all kept hidden until the site’s administrators decide that it’s ready for publication. The site’s colours—wine-red & cream—have long been associated with EWB, so it was an obvious step to continue them on the web. ardes wanted to take a familiar sight in Sheffield—street signs—and base the logo on them. EWB’s logo looks like a street sign attached to the characteristic blond stone of the South Yorkshire / Derbyshire region. One of the aims ardes always has in mind for any website we create is “Return-On-Investment” (ROI): how quickly what we make for you will cover the costs of development. For EWB Estate Agents, this is partly calculated into the time saved by inputting data in one location—their desktop application. More importantly, however, EWB’s agents are no longer running around, delivering sealed bids & encouraging bidders to try again—Live Offer saves them hours with each home sold, so they can concentrate on getting new homes to sell. See more examples of our web design & corporate identity.